I missed Off Bloom last year when they released their debut EP Love To Hate It. Well, I didn't miss them, but the blog missed out on them because of my much talked about slack nature throughout 2016. 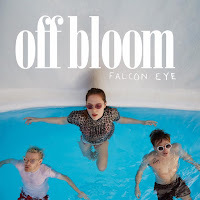 But in case you missed them too (I have no idea who this is directed at, I know nobody is reading) Off Bloom are a trio from Denmark making this insane off the wall pop music with an abundance of Eastern-influenced tinges. In addition, if you weren't aware of Off Bloom before now, we did discuss them on the last episode of The Middle Eight Podcast, which you can listen to here. 'Falcon Eye' demonstrates this to a T, and it's made that bit better with the fact that no one else is making music that sounds anything close to this. Have you ever desired to shake it like you want it all? Because if not, this is the song that will not only unleash your desire to want it all, you might just end up having it all. Nope, I've no idea what I'm on about either. I recently missed Off Bloom supporting Raye in London, I had no idea they were on that show and I'm still pretty cut up about it. However, luckily for me the trio are supporting both LANY and Dua Lipa on their upcoming UK/Euro dates, and they've been announced for both Live At Leeds and Great Escape Festival. Given what a massive party tune 'Falcon Eye' is, I'd say it's probably worth catching them at at least one of those.